This week’s highlight fixture in Serie A sees the race for Champions League soccer take centre stage as AC Milan take on Lazio. Can AC Milan consolidate their top four position? Will Lazio overtake their rivals? Read on to inform your AC Milan vs. Lazio prediction. AC Milan come into the game as marginal favourites (around 38% chance) against a Lazio side looking to break their winless streak at the San Siro. The Over/Under market odds marginally suggest it will be a low-scoring contest, with under 2.5 currently priced at 1.869*. Gianluigi Donnarumma could make his return in goal should he recover in time from his calf strain, whilst Fabio Borini is likely to return to the bench. Samu Castillejo and Patrick Cutrone will be hoping to make an impact from the bench should they not get a starting place. Jordan Lukaku and Valon Berisha remain sidelined through injury, whilst Felipe Caicedo and Marco Parolo will be vying to make the starting eleven after starting the last game against Sasouolo. As we enter the final stretch of games in the Serie A, by far the most compelling narrative is the race to secure European football next season, which includes the two teams featured this weekend, as fourth-placed AC Milan take on seventh-placed Lazio – split by just three points. What’s more is that Atalanta, Roma, Torino, and Sampdoria all still have a realistic chance of making the top four, with the gap between AC Milan in fourth to Sampdoria in ninth being just seven points. At this critical point in the season with seven games to go, the race for Champions League could potentially go all the way to the last game of the campaign. AC Milan are without a win in their last four Serie A games, their joint-worst run of the season. Meanwhile Lazio’s inconsistencies this season have prevented them from truly locking down a top four spot – which was evident recently when they defeated third-placed Inter away, and followed it up with a defeat and draw against SPAL and Sassuolo respectively. With rumours of Gattuso potentially losing his job should he suffer another negative result, the pressure will really be on his side to secure the win. The Rossoneri have relied on the goal scoring exploits of joint-Capocannoniere Krystof Piatek, who has carried his remarkable form over from Genoa, scoring eight in his first 10 games for AC Milan since joining in January. Without him, AC Milan may not have ended up in the position they find themselves in, with their Champions League destiny in their own hands. Lazio meanwhile have had Luis Alberto and Joaquin Correa to supplement the attacking exploits of former Capocannoniere Ciro Immobile, with the two midfielders contributing 15 assists and six goals to Immobile’s 14-goal haul so far. Despite this, both teams have a similar attacking and defensive record in Serie A thus far, with Milan scoring one more and conceding two less than Lazio. According to xG, Lazio have been underperforming quite substantially, scoring six goals less than forecasted – the third-worst attacking underperformance in the entire league. If Lazio are able to find their goal-scoring touch, they may be finally poised to break their 29-year San Siro curse and record an away victory against AC Milan for the first time since the 1989/90 season. 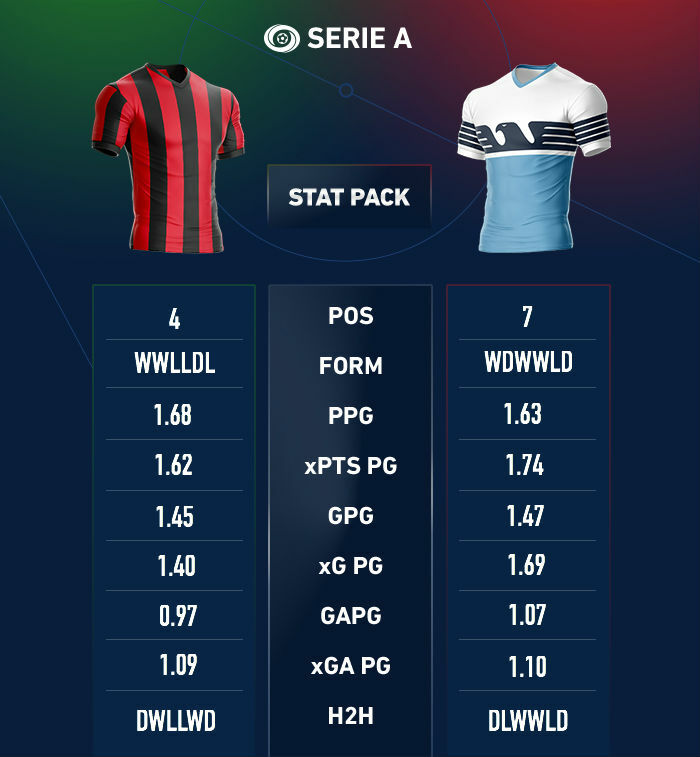 For AC Milan, they know they cannot afford to make it five league games without a win, and will be desperate to create some breathing room from the teams below them with a confidence boosting victory against top four rivals Lazio. Saturday’s game has huge significance for both teams at this stage of the season. Both know a negative result will allow the chasing pack to make ground - or displace them entirely. AC Milan vs. Lazio: Where is the value? With both teams vying for a win, combined with the attacking proficiency of both, the opportunity of a high-scoring game could become a value opportunity, and bettors can get Over 2.75 at 2.330*. Given Lazio’s record at the San Siro, bettors could opt to back the home side to continue Lazio’s torrid time in Milan, and can bet on AC Milan -0.25 on the Split Handicap at 2.320*.